View More In Battery Packs & Chargers. 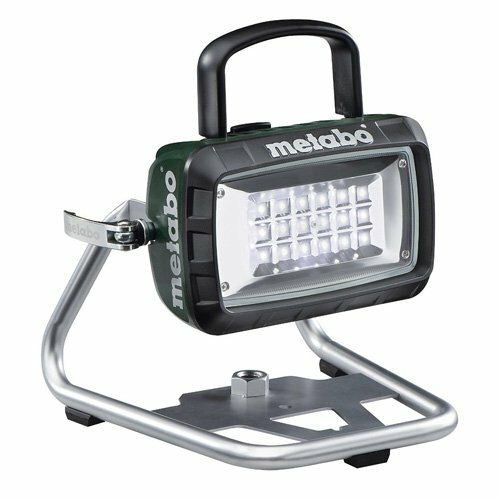 The Metabo BSA14.4-18 LED Site Light is design for the professional user and runs on all Metabo Li-power battery packs. With 18 powerful LEDs, this light produces a powerful, bright, and equal light able to produce wide illumination of rooms and work areas. The two modes allow the user to adjust the illuminations from 1100 lumen on low to 1800 lumen on high. The light can be swiveled quickly and infinitely by 180 degrees and its base is designed for stationary usage on the ground, wall or tripod. The Metabo BSA14.4-18 LED is sold as a bare tool and comes without battery and charger. High performance: 18 LEDs delivering bright extensive and equal light. Minimum heat generation: the light gets only warm to the touch. If you have any questions about this product by Metabo, contact us by completing and submitting the form below. If you are looking for a specif part number, please include it with your message.